The Central Connecticut Celtic Cultural Committee has been formed for the purpose of fostering, promoting, and celebrating the cultural and historical contributions of Irish and Irish-American individuals and groups in Central Connecticut. To achieve this purpose, activities include the sponsorship of the Greater Hartford St. Patrick’s Day Parade, including the selection of the Parade Person of Year and the Parade Grand Marshal. Other activities include sponsorship of the Celtic Sons & Daughters Scholarship program and planning or promoting additional events and activities aimed at promoting Irish culture. 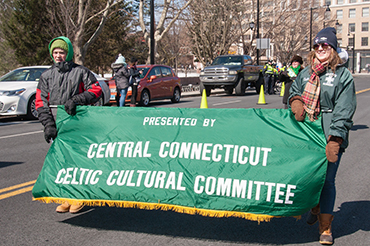 The Greater Hartford St. Patrick's Day parade is proudly presented by the Central Connecticut Celtic Cultural Committee.